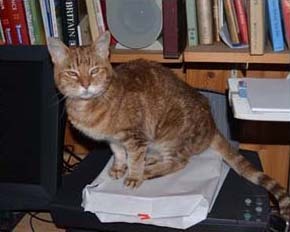 No wild blood, so no wild cat tendencies! 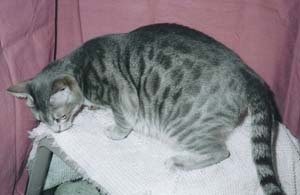 Since 1986, Purrfurdots Ocicats has been breeding healthy, "wild" looking domestic Ocicats without feral tendencies. 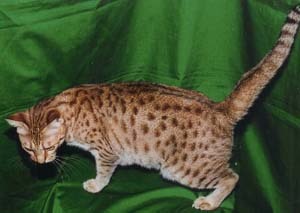 Ocicats originated in 1964, with a delightful mix of the Abyssinian and Siamese cats with a bit of American shorthair genetics. 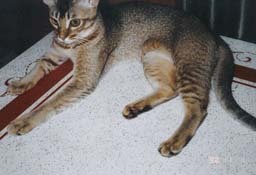 When it comes to socializing with people and other pets, Ocicats are dog like; they are very friendly towards other living things. Ocicats are very affectionate, but not clingy. Inquisitive, smart, and fun loving, Ocicats are always instigating fun! 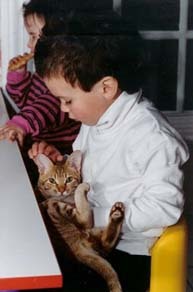 Ocicats get along great with children! Quick to learn! Spirit (chocolate silver classic) was potty trained by 7 months old. 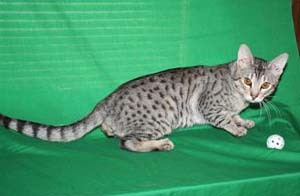 Ocicats are available in twelve different colors, in which we often have several from which to choose. 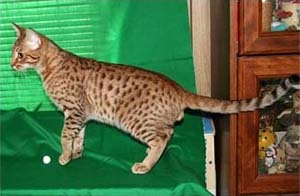 Spotted and other varieties can include unique patterns and markings like classics, ticked, ivories, and solids. 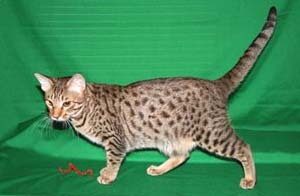 Ocicats are the largest of the shorthair breeds registered with the Cat Fanciers' Association (CFA). 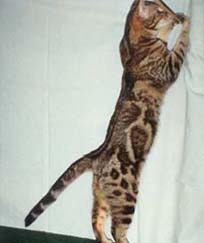 Even though they can be large and robust, Ocicats are healthy, muscular, and agile. 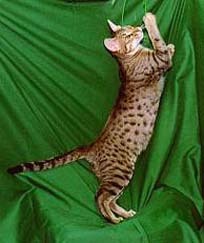 Sporting short coats, Ocicats require low-maintenance grooming, as their shedding is minimal and tend to be accepted by owners with allergies. 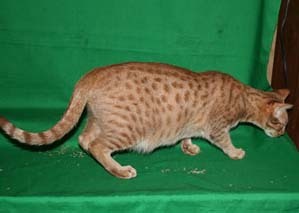 Purrfurdots offers pet and show Ocicat prospects from Champion, Grand Champion and lines with distinguished merit. 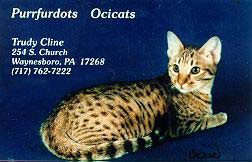 We have a selection of sweet-tempered, totally domesticated Ocicat kittens year-round, right here in Pennsylvania. They reside on our premises with all of their parents, eager to accept your attention and love. We offer a one year limited health guarantee on all of our kittens. 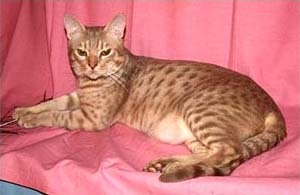 Unlike other breeds that contain wild blood, our Ocicats will not turn on you, refrain from using the litter box, or have any desire to behave as if they are feral cats. Purrfurdots has been lovingly creating "Happy Go Lucky Ocies" for about three decades, and we are proud to bring you CFA registered Ocicats and kittens in great health and full of love. 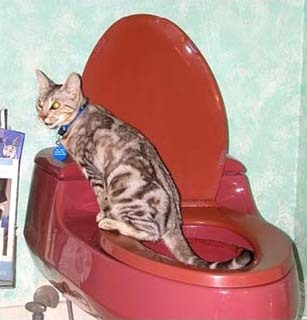 This is why we have ALWAYS received "CFA Cattery of Excellence" Certification at inspection time! 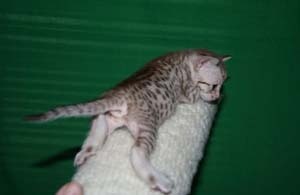 If you're interested in adopting an Ocicat kitten or adult contact us today for more information about our litters! 4 solid chocolate newborn kittens-the brownie brigade!